Whether you’re a seasoned pro, starting your first lesson, or still dreaming from the side lines, you’ve probably realised that the horsey world has its fair share of characters. From the always-winners to the nervous-wreck, there are key figures you’ll start to recognise all around you. 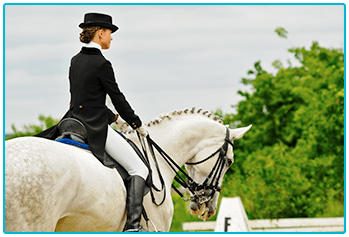 To help you negotiate the equine world, The Insurance Emporium have put together a handy guide to help you identify the five types of horse rider you’ll definitely meet! Read on to find out more! Nobody knows when they came to the yard, but no-one can remember them not being there. They have a tendency to pop up at the worst moments; like the day you’ve been thrown off three times in ten minutes, and your horse has forgotten everything you ever taught it. Full of wisdom and advice, they’ll have your mare trotting meekly like a dressage pro in no time, leaving you amazed at their infinite knowledge. Horses are large and powerful, so safety is important when working with them. The Health and Safety Officer, however, takes this to another level. 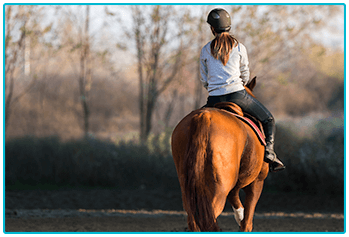 They can be easily spotted by their head to hoof protective gear, and often spend more time discussing the safety risks of a ride than actually doing it. They take great delight in providing you with a risk assessment on any activity you try, whether you asked for it or not, and are ready with an ‘I-told-you-so’ face whenever it goes wrong. The Rebel is the total opposite of The H&S Officer. They have a rather inflated sense of their own immortality, and consider a body protector ‘overkill.’ Usually found dashing round with the bare minimum of tack, on top of a barely broken horse. The Rebel is not a fan of traditional schooling, preferring to let the horse lead the way – usually towards the nearest hay net. You switch between admiration at their endless optimism, and preparing to call the emergency services at any moment. The Show Pony likes to win. A lot. And they’re very good at it. These are an easy breed to spot; they’ll have a horse which cost more than your mortgage, and a stable door covered in winning ribbons. Experts at winning since they could sit up in a saddle, they are adept at cutting down any competition with a withering glance and casual comment. They can be found endlessly practicing dressage in the ring, or sobbing inconsolably after being placed second in the village show. No-one is entirely sure why The Nervous Wreck decided to take up riding, least of all them. They spend most of the time worried that their horse will throw them off, or crush them, or any other number of grisly outcomes. They’re kind to their animal, but also clearly scared to death, and will do anything to avoid actually getting on. Once riding, they can be found hanging onto the pommel for dear life, refusing to get above a walk, or a trot if they are feeling really ambitious. Wherever you are in your riding journey, you’re sure to spot these familiar tropes along the way; maybe even in yourself. Wherever you fit in, why not check out The Insurance Emporium’s Horse Rider Insurance? You can even bag up to 30% discount^ on new policies! 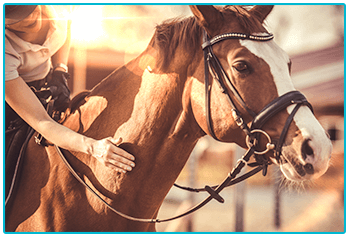 With Personal Accident a Standard Benefit on Horse Rider Insurance, it might be perfect for The Health and Safety Officer; you may have to be persuasive to get The Rebel to agree, but it could be well worth it! ^ The 30% discount is made up of 15% Introductory Discount plus 15% Family Discount (if appropriate). The Introductory Discount is available for the first 12 premium payments on lunar and calendar monthly policies or one premium payment on annual policies.